I'm back with a new freebie for you! Every year around this time I try to make some Dia de los Muertos-themed goodies in addition to the usual Halloween freebies. Last year I posted a sugar skull art print, a sugar skull wallpaper for your iPhone and sugar skull bunting. This year I'm continuing with the sugar skull theme with this free digital paper set. 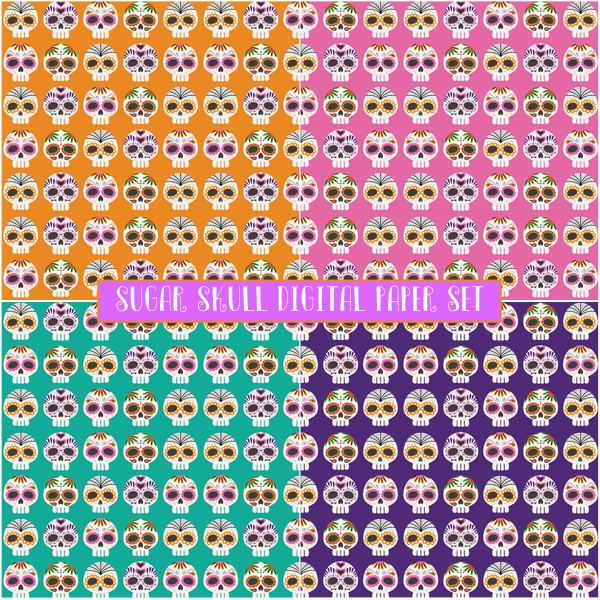 I found this super cute sugar skull pattern on Freepik.com, then changed the background color to make 4 12x12 inch sized papers in orange, pink, teal and purple. Feel free to use them for your any of your Dia de los Muertos themed design and crafting projects. As usual, just click the image above to download. Enjoy!